By: Caitlin G. Pinsof, M.A. 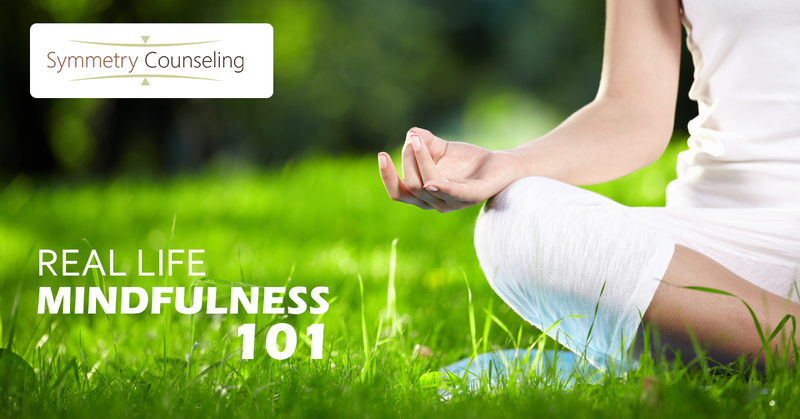 If you’ve recently been to a yoga class or read a self-help book, you’re probably familiar with the term mindfulness. During therapy, your counselor may tell you to be mindful of your emotions or behavior in a particular situation. Numerous research studies continue to demonstrate that mindfulness based interventions provide stress reduction and overall symptom reduction for many mental health conditions, including anxiety. Yet, understanding how mindfulness can really help you and applying it in day-to-day life outside of therapy sessions can be challenging. Mindfulness is a founding principal of a number of Eastern religions and a pillar of both yoga and meditation. The term mindfulness is actually a translation of the Buddhist term sati, which means to remember or recollect. This process invites the individual to develop insight into the true nature of reality through mindful inquiry. Through this inquiry, the individual also develops insight into the true nature of the self. Perhaps mindfulness allows us to return to a more authentic place within ourselves, both in and outside of therapy sessions. The practice of mindfulness is rooted in a pursuit of truth, one that can help us to cope better with the suffering we all experience at some point in life. Much of this suffering comes from circumstances we cannot control in life, a universal human experience that can affect our mental health and wellbeing. In addition to external factors, our minds can often become the site of thinking patterns that can hold us hostage to our fear and anxieties regarding the past or future, sometimes stemming from anxiety or depression. This keeps us out of the present moment and robs us of many of the small joys life, in the moment, can offer. Essentially, mindfulness allows us to more skillfully navigate the two most challenging aspects of the human experience, our relationship to ourselves and to the things we cannot control. One of the easiest and quickest ways to practice mindfulness is through using grounding exercises, especially to manage distressing emotional and physical experiences or help anxiety. By tuning into our five senses, we can disconnect from negative and obsessive thought patterns while calming our body’s natural stress response. This exercise has five steps, takes about five minutes, and can be done anywhere. Don’t judge any thoughts or feelings that come up—just continue with the exercise. Practice regularly for best results. Notice 5 things you can See. Bring your awareness to five things you are currently seeing. Look around and try to notice things you don’t normally notice, like a shadow or a small crack in the floor. Or, pick a category like colors or shape. Notice 4 things you can Feel. Bring your awareness to four things you are currently feeling, like the texture of your pants, the texture of the seat you’re sitting in, or the feeling of the breeze on your skin. Notice 3 things you can Hear. Take a moment to listen, and notice three things that you hear in the background. This can be the chirp of a bird, the hum of the refrigerator, or the sound of traffic nearby. Notice 2 things you can Smell. Bring your awareness to smells that you usually filter out, whether they’re unpleasant or pleasant. The breeze may have a whiff of pine trees if you’re outside, or the smell of a fast food restaurant, or maybe the faint smell of your laundry detergent left on your clothes. Notice 1 thing you can Taste. Focus on one thing that you can taste right now, in this moment. You can take a sip of a drink, chew a piece of gum, eat something, or just notice the current taste in your mouth or open your mouth to search the air for a taste. If you’d like to learn more about the transformative power of mindfulness and how it can help you, contact Symmetry Counseling to schedule a therapy consultation with one of our mindfulness specialists.